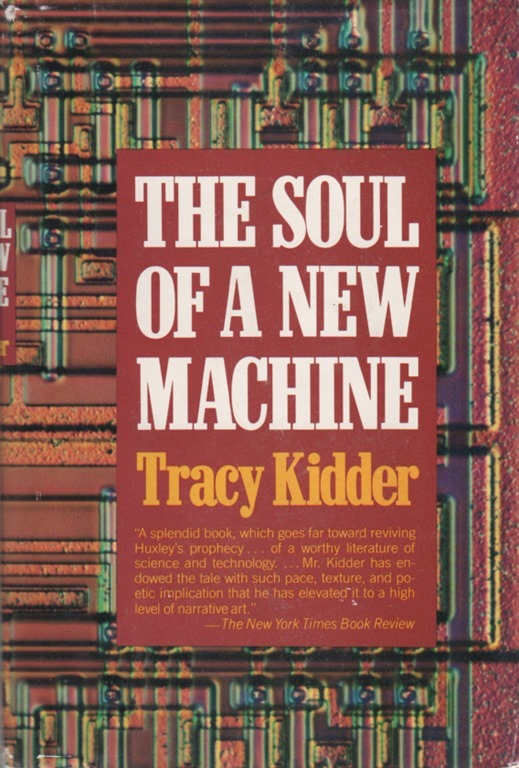 I first read The Soul of a New Machine by Tracy Kidder just after it came out in 1981, before it won the Pulitzer and National Book awards in 1982. I read it again at the end of 2016. Thirty-five years later it is still a stunning book, even though the Data General Eclipse MV/8000, the title character, died long ago, a few remember. As I read The Soul of a New Machine a second time, I kept thinking, “What happened to these great people who worked so hard?” I decided I’d provide a review with research/annotations/links. If you haven’t read The Soul of a New Machine I highly recommend you do. Most books about science and technology date very quickly, but this one hasn’t. Why? Because it’s about people, not a machine. The story reads like a novel. I’ve spent days struggling to write this essay. The book is about engineers who push themselves to produce a new computer, working 80+ hour weeks, not for money, fame, or rewards. They are driven to invent by their desire to master knowledge and skills. I’ve always wished I had that kind of passion. A few days ago I read “How to Become a ‘Superager’” in the New York Times, that reports that older people who push themselves mentally stay cognitively healthy longer. It’s more than doing crosswords though. I believe what they were talking about is like how the folks worked in this book drove themselves to master a problem. You just keep going, keep working, keep trying, keep pushing, until the problem is solved. Because I’m retired, I know I can quit and kick back at any time, when I tire of a task. But I want to finish this essay, and I’ve had to constantly push myself. I wanted to reread this book, carefully summarize it, and find out everything I could about what happen to the people in the story since it’s publication. I’m going to hyperlink the hell out of this review for two reasons. First, if you just read The Soul of a New Machine and have the same questions I did, this should be a handy resource. Second, if you haven’t read the book, seeing why I’m so fascinated with a 36-year-old book about a forgotten minicomputer should make you want to read it. The Soul of the New Machine is a perfect example of what is now called creative nonfiction, but that term didn’t exist back when it was first written. It essentially means using techniques borrowed from novelists to write compelling nonfiction. This writing technique is old, but I first noticed it in the 1960s. Truman Capote used it in his 1965 book, In Cold Blood, which he called a nonfiction novel. Tom Wolfe used it for The Electric Kool-Acid Test in 1968 and called it New Journalism. So by 1978, Kidder had plenty of models to choose from. What’s particularly impressive about The Soul of a New Machine is Kidder didn’t know anything about computers. His editor at The Atlantic told him to write about computers. He didn’t want to. Then Kidder went sailing with Tom West, the god of the new computer, and became part of the story. That’s another common aspect of creative nonfiction – the author becomes a character in the story, letting us readers know how the story came to be. Here’s a Zen koan. Who would you want to be – the storyteller or the subject? Back in 1978 would it have been more rewarding to be Tom West or Tracy Kidder? Or Carl Alsing, Chuck Holland or Ed Rasala. A Hardy Boy or Microkid? But I’m getting ahead of myself, because you probably don’t know who those people are. My point is Tracy Kidder had to learn about computers, but he also had to learn about why computers were so fascinating to this small group of people, and why they wanted to build a new one. Kidder had to go beyond that, he had to learn what how each of these engineers got on the path that led them to become creators of a computer. His effort was no less than the engineers building the Eagle. When I reread a book I love, I want to know everything I can about it, especially about how it was written, and if the book is about real people, what happened to them after the book came out. This review will be full of links to the articles that answer some of those questions. I wish I could write like Tracy Kidder and write the 2017 update to the story. But just writing these 2,000+ words showed me how much work that involves. Writing 100,000 words is beyond my comprehension. In February of 1978, Digital Equipment Corporation (DEC) introduced the VAX, a groundbreaking line of 32-bit minicomputers. The story opens at Data General, DEC’s competitor, and their need to quickly produce a 32-bit supermini to compete with the VAX. Data General had a popular 16-bit minicomputer called the Eclipse, but decided to design a whole new 32-bit computer, code named Fountainhead, that would be superior to the VAX. As a backup, manager Tom West proposed a second project, to upgrade the Eclipse to 32-bit, which they code named the Eagle. The Soul of a New Machine is about the tremendous management and technical effort to redesign a 16-bit machine to work flawlessly as a 32-bit machine without a mode-bit. So owners of the 16-bit Eclipses could buy the new machine and run all their old software without any conversion. This rush effort took place in 1978 and 1979. In many ways it prefigures Steve Jobs’ effort to produce the Macintosh a few years later. Because they are stories about the men and women working long hours, sacrificing their personal lives, to give birth to a machine. Most of the events in the story take place during 1978-1979, at Data General’s headquarters in Westborough, Massachusetts, off Route 495, in building 14A/B. I wish I could find photos of the actual offices and labs, especially where the Hardy Boys and Microkids worked. I’d like to see what their debugging tools looked like, and the prototypes named “Coke” and “Gollum.” This one photo from the early 1980s is the best I could do. Kidder interviewed his subjects secretly at Data General, and outside of work, going to their homes, parties, outings and even sailing with Tom West. I wish I could find photos of those events and locations, but so far I haven’t. It’s weird to think such an heroic project took place in a dull basement of a nondescript building. The first report from Wired Magazine shows the photograph on the right and lists who they were and where they are now. Unfortunately, the photo does not include Tom West, the Ulysses of the story. West was the manager who gathered a team of about two dozen men and one woman to build the Eagle, essentially in secret. Data General gave the real Fountainhead project publically to the engineers who had moved to North Carolina. There were two teams – The Hardy Boys who worked on hardware, and the Microkids who wrote the software. West had two lieutenants, Carl Alsing, who supervised the Microkids, and Ed Rasala who bossed the Hardy Boys. Tom West – was the top level manager, and essentially the protagonist of The Soul of a New Machine. The best post-book profile of West I found was “O, Engineers!” from Wired Magazine, for the 20th anniversary of the book. This essay is well worth reading because West talks about how the book affected his memory of events. He didn’t always appreciate the fame the book brought. Plus it’s a good summary of the story and an update about how people came to judge the book. I also found The Computer Museum Report from Spring, 1983 which reprints a dialog between Kidder and West. West died at 71, in 2011. Here is his obituary at the New York Times, and one at the Boston Globe. Steven J. Wallach – was the Eagle’s architect. A 2008 New York Times piece that chronicles Wallach’s whole career. He continued to design computers and start companies after he left Data General. Carl Alsing – was probably the second most important character in the book. Tom West was often a mystery to the Hardy Boys and Microkids. Alsing was his John the Baptist. This 1974 DataGeneral newsletter has some photos of younger Alsing and West. I found this YouTube video for the Science Friday Book Club that interviews Asling, Holland and Shanahan in 2015. It briefly shows the ball maze Chuck Holland created and mentioned in the book. When I read that part I really wanted to see it. 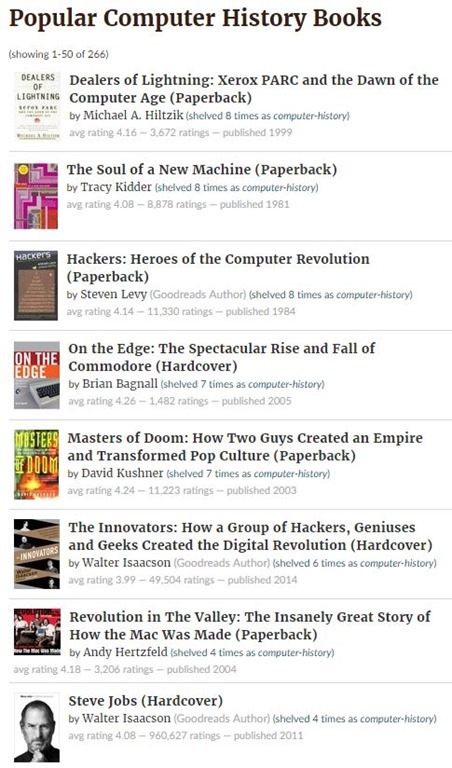 Just look at Goodreads “Popular Computer History Books” – The Soul of a New Machine comes in at #2. I’ve read many of these books over the years, and I find them incredibly inspiring. I worked with computers most of my working life, but I was always a low-level programmer, web designer, or computer tech support guy. I guess reading computer history books for me is about envy. Rereading The Soul of a New Machine is like reading family history, but about my cousins who succeeded in the big time. I’ve always loved science fiction and computers. I’m not the only one, became that combo is common. The Soul of a New Machine is also #2 on “50 All-Time Classic Books About Computers and Computing.” I have to assume there are many readers out there like me. Yet, as I reread this book I constantly asked myself why I was reading about technology that went to the scrapheap decades ago, was never famous other than being in this book, and about computer engineers that few people remember today? Yet, reading The Soul of a New Machine was just as much fun in 2016 as it was in 1981. The Soul of a New Machine is about how hard work leads to creativity. It’s about being different. The men and women in this story have keen intellects, were often loners, and all had unique hobbies peculiar to engineers. It’s a story about people who can focus on one goal with such concentration that they almost forget everything else in life. Tracy Kidder tells an amazing story about amazing people in amazing detail. Yet, in 2017, why would anyone want to read about the design and engineering team that built a long forgotten minicomputer, or a company that went out of business, and was never legendary or insanely great? I doubt younger people even know the terms mainframe, minicomputers and microcomputers. Or care about a time when a business struggled to bring out a 32-bit computer to market when 16-bit was the standard. All of that technical history doesn’t really matter. What matters are the people. Rereading The Soul of a New Machine makes me ask the question at the top of the essay. Most kids today daydream of growing up to be a star – whether in sports, movies, music, television. They want to be rich, famous, or some kind of superhero. If I was a kid reading this book, I’d want to grow up to be like Tracy Kidder, Tom West, Carl Asling, or any of the people in that group photo above, or the people profiled in the books at Goodreads. Most kids won’t become Beyoncé. I didn’t become Bill Gates. When I reread The Soul of a New Machine I experience a beautiful sense of regret. I lived through some of the most exciting times in technological history. I was in the stands watching, and that was great, it wasn’t the same as being on the field, but it was still very cool. I always enjoy these popular histories of science and technology. When I trained in Library Science the lab had two old Vax stations which were assigned to myself and a friend, I was a former archaeologist and he was a former palaeontologist, perhaps that is why we were assigned what were antediluvian machines even at the time. I remember the Prof would say class hit the “”””””” key quickly followed by not you two. It was incredibly instructive. It is amazing to see how far computers have come, sort of like the switch from horses to automobiles our parents and grandparents experienced. I think there may be a copy in the basement I will keep an eye out. Great job. I really enjoyed reading this. I’m going to have to check out this book! I read THE SOUL OF THE NEW MACHINE when it was first published. I became a Tracy Kidder fan and read all his books. My favorite is HOUSE. I love books that explain how complicated endeavors–like building a new computer or building a house–actually happen. Tracy Kidder finds a way to explain the complicated and difficult in ways that make sense to me. WOW, I’m going to find this book. I have a great used book store in Seattle and tons of credits there. Thanks for the review and comments. You’ve piqued my interest! I read this book in 1985, then in 2000, and rereading it again now, 2017. Fantastic book on team interaction and Project management. Thank for the article. Curiously, I have just re-read this book as well, having bought it originally in 1981. I retired from the IT industry after 51 years just 18 months ago and I was interested in seeing how the book had aged. The answer? Not at all. It is about the process of creation which is primarily a people thing. They could have been developing a software system just last week instead of an obsolete computer in 1981. I am now trying to get a former colleague (early thirties) interested in reading the book to see what he thinks about it and if agrees with me. Thanks for a nice review. Charles, I believe The Soul of a New Machine is a minor masterpiece of writing that works on many levels. It should be perfectly readable as a story to people who know nothing about computers. Its essence is about people who push themselves hard to create something wonderful. Great article. I have read Soul of a New Machine many times and will probably read it many more. It is the people that brings you back to the book even though you know the outcome. Their struggle with technology and company are still relevant today as it was in their time. Next Next post: Am I Going Blind in My Dreams?